These Underlying Philosophies inform the 9 Principles of Practice which guide any Mediator or Conflict Coach trained in the CAOS model. Together, these form the framework for our training of mediators and conflict coaches and also extend into our external training for individuals and organisations wanting to develop and practise more effective communication and to be more creative and effective in their responses to conflict. Our model has developed out of more than 20 years' experience of working in community related fields of mediation including neighbour disputes, workplace disputes, student complaints, special educational needs complaints, NHS complaints, disability discrimination complaints, homelessness mediation, group disputes, family related difficulties and many other areas where unresolved conflict has been challenging for those involved. 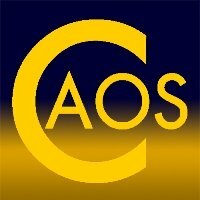 The CAOS Model provides a consistent and rigorous philosophical and practical framework for Mediators and Conflict Coaches to use as their benchmark for practice without becoming bogged down in 'academic theory' which, by definition, deals with abstract concepts rather than practical application. Our trainers all practise their mediation and conflict coaching in line with the Underlying Philosophies and Principles of Practice and use the rigorous framework they provide to inform the way they respond to any given challenge within a mediation or conflict coaching scenario, and in the organisation and management of a case or client relationship. As a result they are able to introduce trainees to the model and show directly how the Philosophies and Principles apply in any given situation. All Mediators and Conflict Coaches accredited by CAOS Conflict Management will have completed the 6-day or 4-day courses respectively, in order to be trained in the CAOS models for those disciplines and will have attended Support and Development sessions at least once every 3 months in order to maintain their self-development as practitioners and to maintain a high quality provision of conflict resolution support. Our Support and Development sessions are interactive and practice-focused rather than being simply 'a meeting' where a discussion on a broad theme relating to mediation is taking place. This ensures that all Support and Development sessions contribute to the improvement in practice of CAOS Mediators and Conflict Coaches and provides a quality-assured service for clients. Those practitioners who do not attend regular Support and Development sessions at least once every 3 months will retain their Practitioners Certificate having been trained, but will not be listed as CAOS-Accredited. Our Support and Development sessions form part of the back-up we provide to our Learning Community of Mediators and Conflict Coaches which promotes a peer-to-peer development model, encouraging self-directed learning and improvement for all CAOS-trained Practitioners. This is in line with our Underlying Philosophies of Ownership, Supporting Empowerment and taking an 'Adult-Adult' approach to our discipline rather than one which looks to an overseeing individual to inform practice. We take the view that the Principles of Practice and Underlying Philosophies are our 'check and balance' rather than a particular 'master mediator'. While we have more experienced Mediators and Conflict Coaches who have embedded this approach into their practice discipline, all who train with CAOS are expected to take full responsibility for their own learning and development, and to continually reflect on and develop their skills and understanding of their role via an experiential learning approach, and with reference to the Philosophies and Principles. This is ensured via our strict accreditation requirements which are not gained simply by attending a course, but by showing an ongoing commitment to learning and development of mediation and conflict coaching practice throughout the practitioner's career. The CAOS-Model treats the processes of Mediation and Conflict Coaching as a discipline to be continually refined, similar to yoga, tai-chi or other disciplines where the practitioner is never 'qualified' as if they have reached an 'end point' in their learning but are always able to learn more and develop. This differs from many contemporary approaches to Mediation and Conflict Coaching which seek 'professionalisation'. CAOS Conflict Management sees such aims as contrary to the inclusive ethos of mediation and conflict coaching where assessment of the ability to practise is not based on academic prowess or curriculum vitae, but on the willingness of the practitioner to continually seek to improve via an experiential rather than knowledge-based approach to learning, focused on interpersonal and intra-personal skills, open-mindedness and creativity. If you have visited this page via a link from the website of a CAOS-trained practitioner you can be assured that they have been thoroughly trained in the application of the Underlying Philosophies and Practical Principles that underpin the CAOS-Model and that if you wish to use their service, you can also be assured that they are backed by highly experienced practitioners in the fields of Mediation and Conflict Coaching. Buy Now for just £4! - click on the image to find out more. 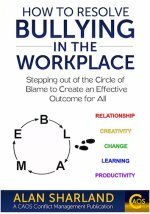 Purchase How to Resolve Bullying in the Workplace - by Alan Sharland - Director of CAOS Conflict Management - click on the image above to find out more. 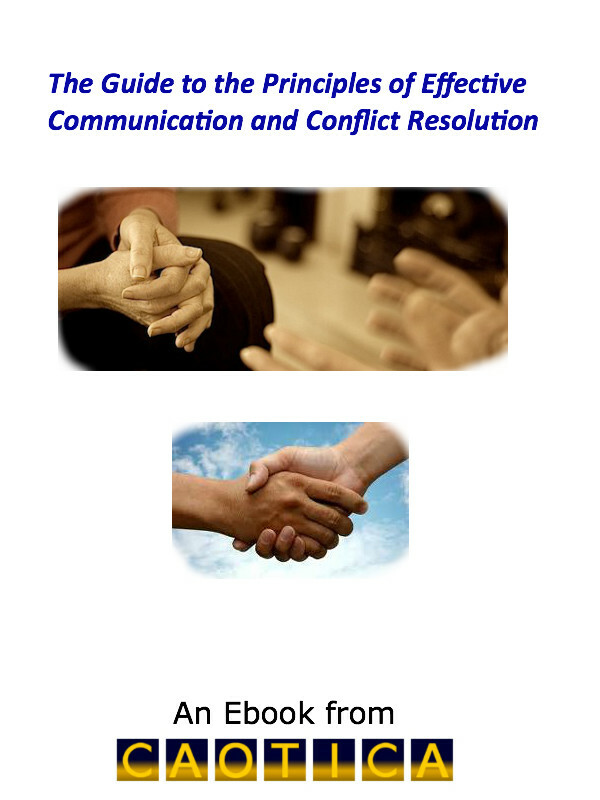 The Guide to the Principles of Effective Communication and Conflict Resolution is a 48-page e-book which describes 9 Principles that support practical, effective communication and conflict resolution. Each Principle outlined has an associated task to help you practise the Principle in your daily life. The Principles are derived from insights gained through the practises of Mediation and Conflict Coaching in a range of different areas of application - neighbour disputes, complaints, workplace disputes, community group disputes etc.